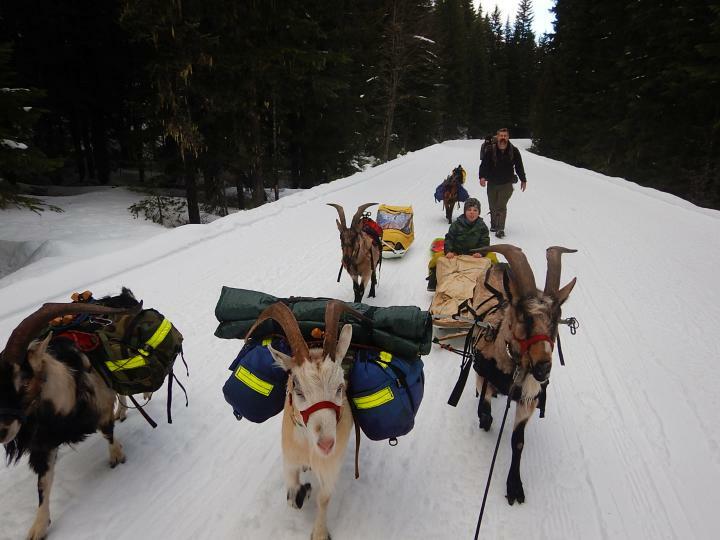 After about 2 months planning and building some nice gear the weekend finally arrived for my kids, my goats my best friend, his daughter and I to go on our first goat powered winter camping trip!!!! And man it was GREAT!!!! 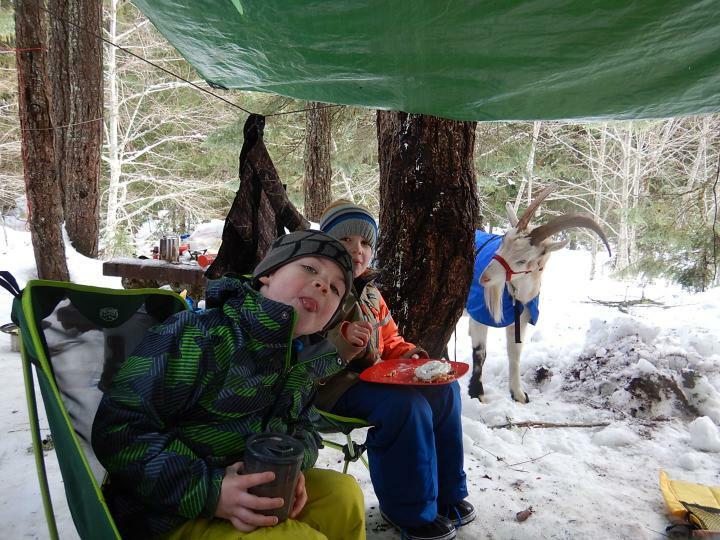 My kids are 5 (son) and 7 (daughter) thet y have been winter camping once before, but we where truck camping so there was a safety net. This time we went big. 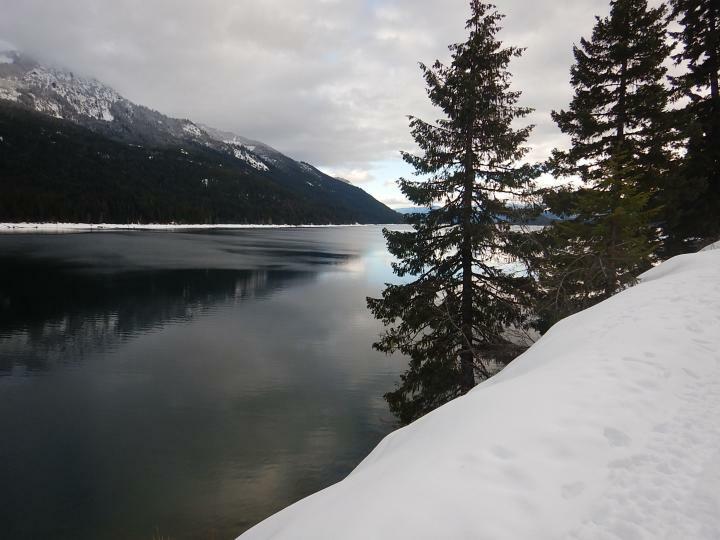 We drove just east of Snoqualmie Pass to Lake Katchess. There is a camp ground up there you can drive to in the summer. In the winter they close the road two miles from it. The road is fairly flatish and it is groomed. 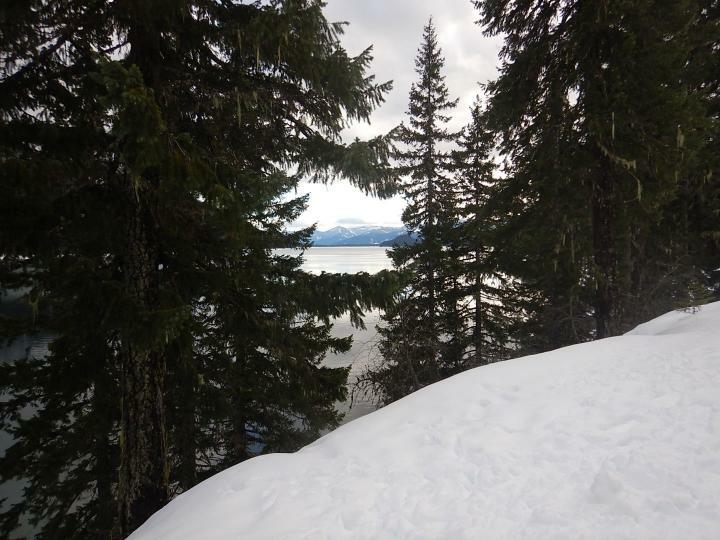 A perfect trail for two little kids on the first winter back packing trip. 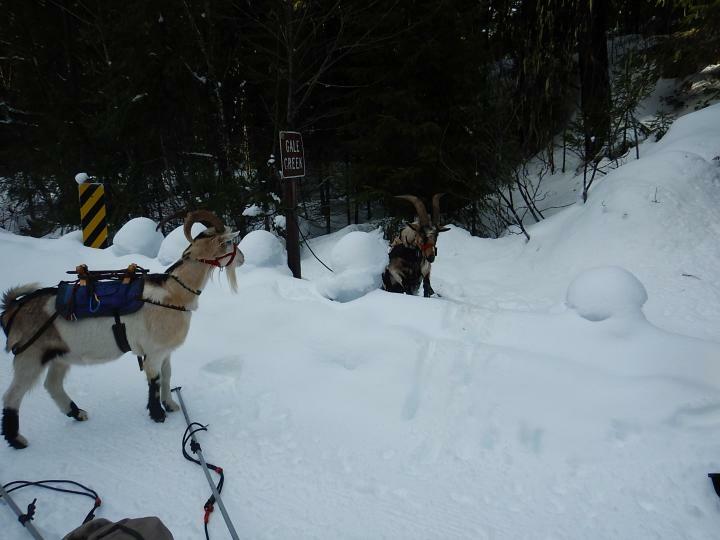 Also a great trail to try out pack goats in the snow and goat sled pulling. We all got to the trail head at about 1130 and where moving by about 1215. The trip in went great. 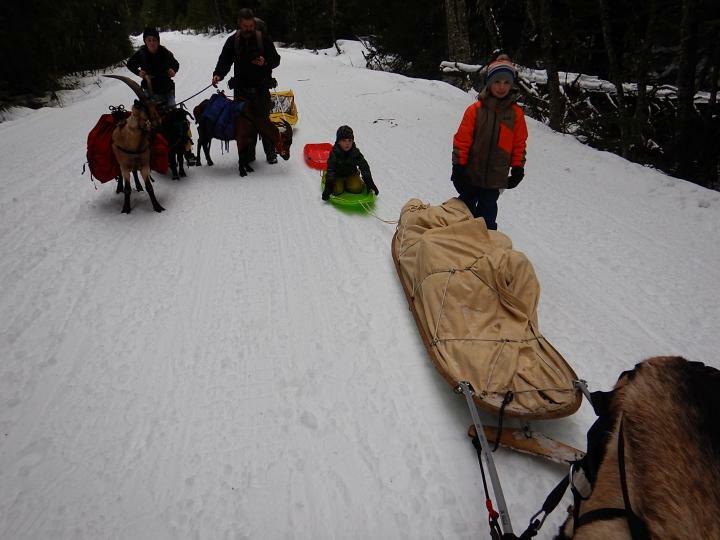 Garbie my biggest Alpine rocked his pulling harness I made ( with a ton of help from Nanno) and dragged a pulk sled full of gear plus my two kids riding on top. Pure Stud!!! Steve and Brian carried there standard loads of about 25%. Everyone did great. The weather could not have been much better. I think it was around 34 degree all day so it was warm but the snow was staying together. Also the heavier packed snow made it easier for the kids to walk even off trail. Even the night time low was warmish around 22 degrees. We ate like kings! Chili with fritos and sour cream for dinner and pancakes with strawberrys and whip cream for breakfast. We also had a never ending pot of hot chocalate going all day in case of Emergencys!!! The goats where a absolute riot and as well behaved as could be. The all packed great and did not mess with anyone or anyones gear. They where a little hisitant about the snow at first but ond they figured out it was same they had what I would describe as dumb puppy moments. They all kinda ran around jumping and hopping in the deeper snow. Brian was the best, snorting and bunting snow up in the air. 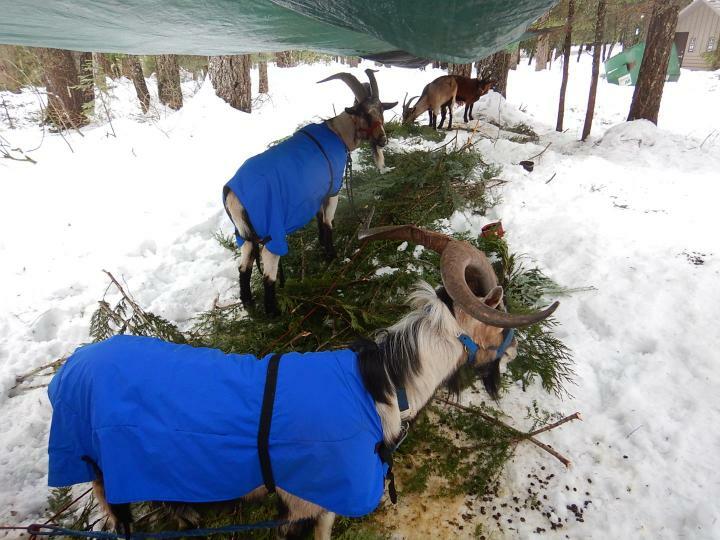 We lowlined them under a tarp and layed down boughs for them to both eat and sleep on. I also coated them at night. The coats worked great. I reached up underneath the coat and feltveach goats back. It was warm but not at all wet. I was affraid of moisture build up, like us in a rubber rain coat. But it was all good. I packed a gallon bag of mixed goat feed and feed them both in the evening and the morning. I definatly dontbthink I had to. They gorged them selves on boughs and other ruffage all day, but it made me feel good so what ever. There was a little bit of exitement at about 0530 in the morning. I woke up to the sound of somthing big running by our tent. It sounded deering in height and stride. I was actually kinda exited to hear a deer run by so close to our tent. Then the I herd the "deer" run back into camp and stop right at our tent door. Believe it or not the noise was not a deer. It was a Steve who some how got him self unhooked and was doing some early morning security checks. When I unzipper therr tent there he was just waiting there looking at me like I forgot to make him coffee or somthing. Needless to say I greated him with some scratches, hooked him back up and went back to my warm sleeping bag a quickly as possible. The next morning was way easier than I could have ever imagined!!! My kids woked up about 0800 and instantly wanted to go play in the snow. So they played and my buddy and I made coffee, breakfast and built up the fire. 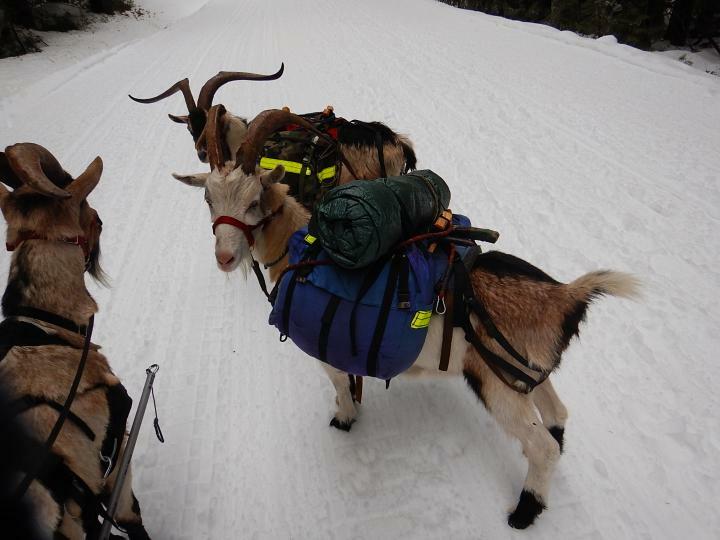 The goats where in great shape, no shivering, ears up, eyes twinkling and ready to work! 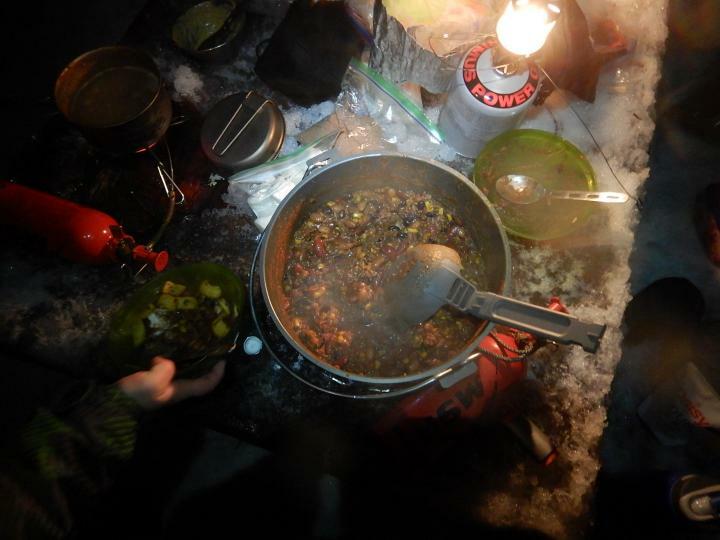 We ate, broke camp, packed goats and hooked up sled then head tontge sledding hill. The kids sledded for at least 2 hours. It was great. I had taken the panniers of the guys but left there saddles on. When my son would sled down the hill I would walk down after him and drag him back up. Well the goats obviously would follow me down the hill. So I got the idea to just throw the sled rope over thr rear cross buck. Steve was a little jumpy at first but them figured it out. We finally wrapped up sledding and headed back to the trailhead. 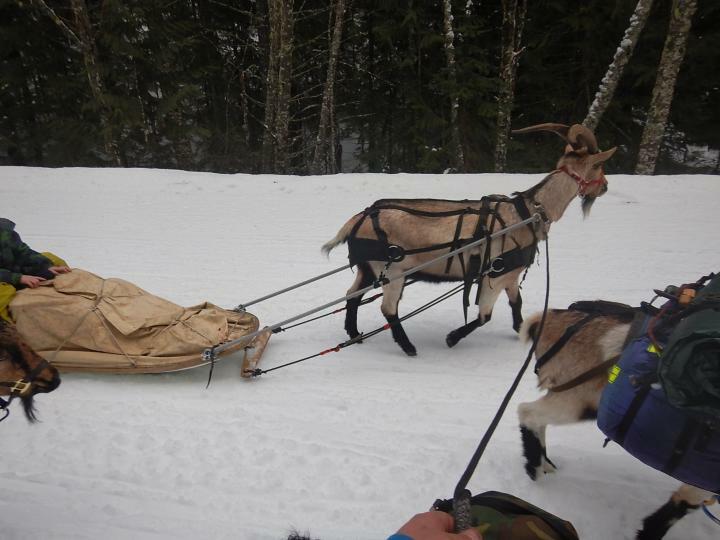 Maile walked and on course Merrick rode his one goat drawn sled. Unloading all that gear back into my truck went much faster than unloading the gear from my truck onto goats and a sled. All and all a great trip, a major dad win and a goat packing success!!! 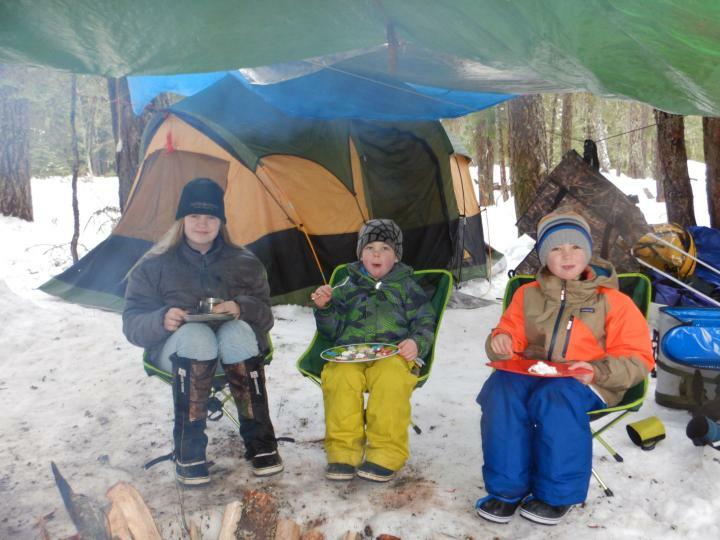 My 5 year old son and 7 year old daughter spent just under 30 hrs hiking and camping in the the winter with zero tears and not one complaint. The goats killed it and I could not be happier or prouder of the whole experiance!!! That is incredible! I'm so glad y'all had a great time! I love the "sled train". I can't get over Brian's horns. They are amazing. Oh, after re-reading your post up there, I'd suggest looping the sled's tow rope over the FRONT crossbuck next time. It helps distribute the weight better, and there won't be so much leverage on the cinch. O' thanks for that!!! I will remember for next time as well as tell my kids. They really like knowing litthy le things like that. 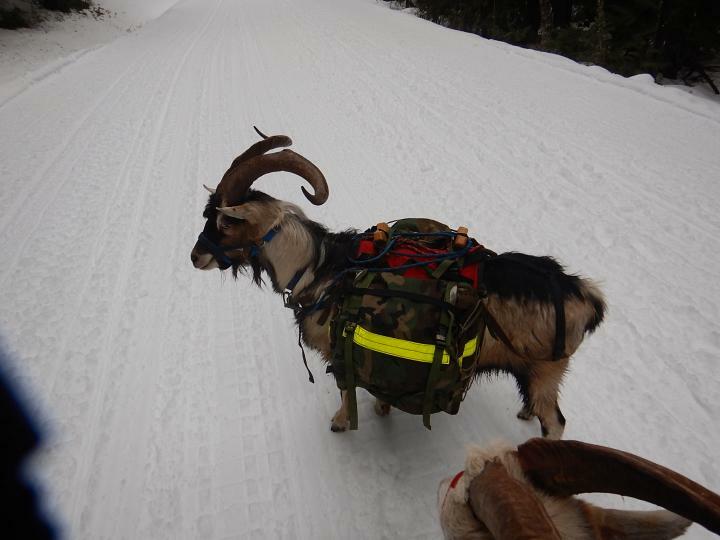 What kind of goats do you have? Looks like a lot of fun I’ve never thought of using a sled. I’m only a couple hrs from Snoqualmie area that’s interesting. 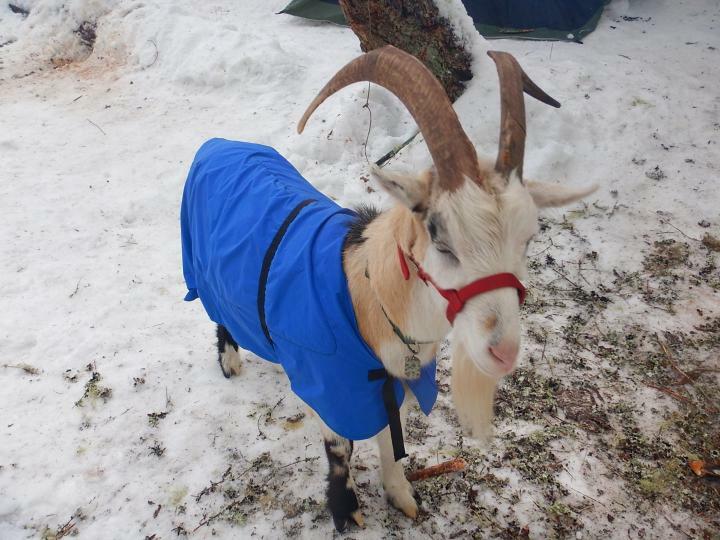 (01-25-2019, 07:13 PM)85ray Wrote: What kind of goats do you have? Looks like a lot of fun I’ve never thought of using a sled. I’m only a couple hrs from Snoqualmie area that’s interesting. There Alpines. Brian throws me off, but people I have asked seem to be pretty positive about it. The sled was awesome. 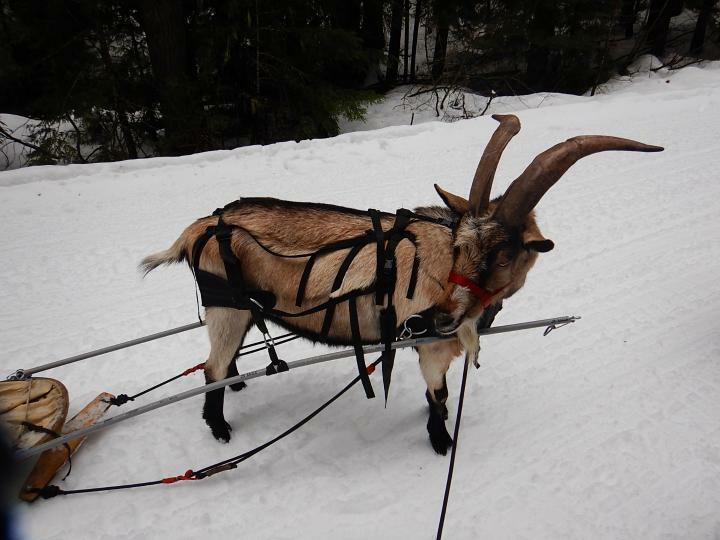 Nanno has some great resources about goats and sleds she has shared in the Carting and Pulling section. 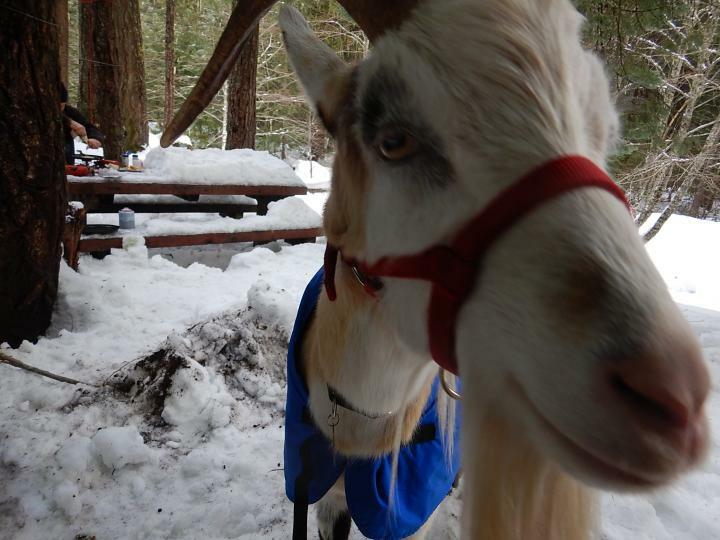 The goats loved the snow. I love lake katchess! I drive to and from wsu often (4x/year) and it is so beautiful year round. I didn't realize that there were campsites there. You're giving me some camping ideas ? This is just awesome, I know that Kachess campground it has a boat launch. Did you have to deal with any snowmobile traffic on that groomed trail? 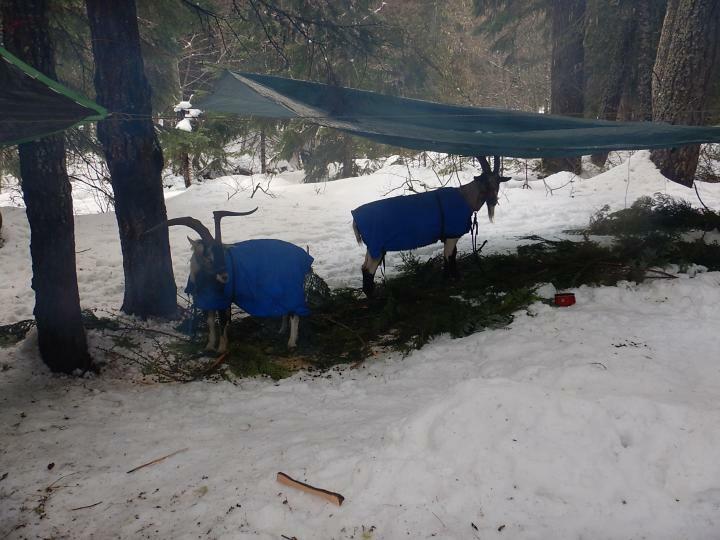 I've been thinking of snow camping with the goats but am unsure about what to take for them to lie on, as a hiker I subscribe to LNT (leave no trace) so no cutting tree branches for me. I did take them on a day hike with some snow a couple of weeks ago, they were postholing along with me up to their knees, didn't seem to bother them. 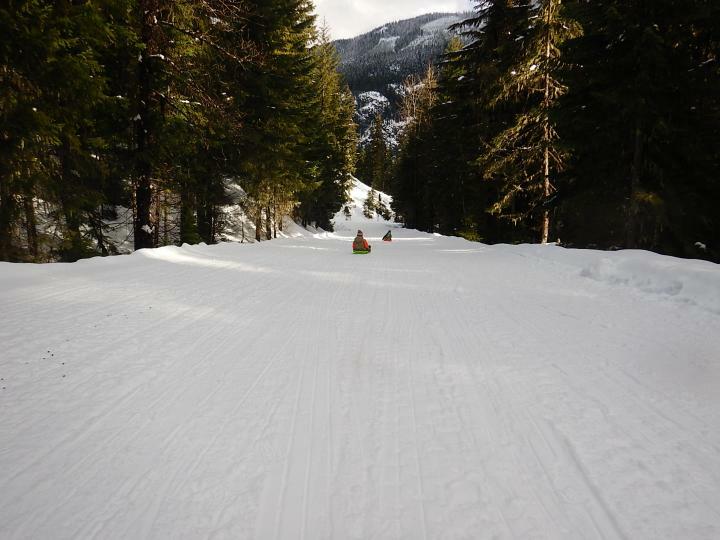 Therewas some snow mobile traffic on the groomed train but, not much. The boys figured it out quick. As for bedding. I dont know, maybe you could cut a cheap foam pad in half. Each goat gets a half. That mightwork.